Hey! Its Scarlett from Made It. Ate It. Loved It. and I am here to share with you one of my favorite fall recipes. Let me just begin by telling you how much I love Fall/Halloween. Any body that knows me knows of my love for Halloween. I spend days decorating my house. I have my Bunco group over for a special Halloween night and I have my annual couples Halloween party;which is probably one of my favorite nights of the year! Well now that I have confessed of my love for Halloween its back to the cookies. These cookies have been my favorite for years! They are always at the Bunco night and also make an appearance at the Halloween couples party. 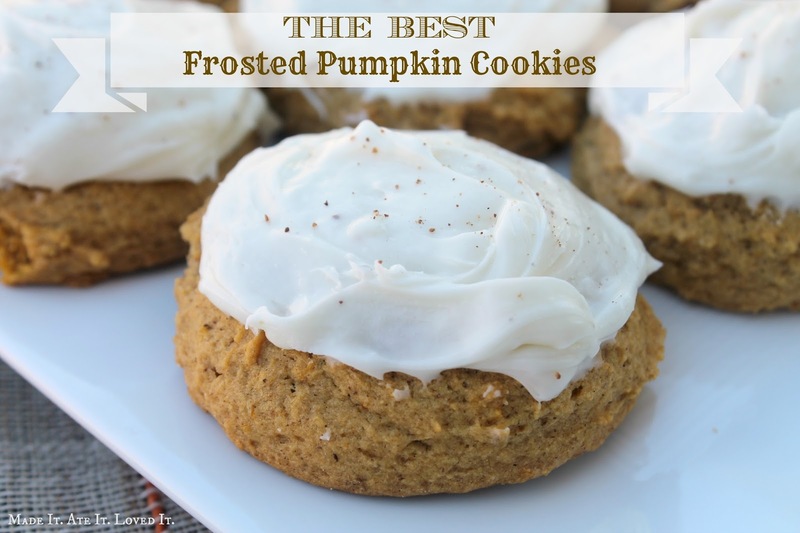 These are the perfect cookie to take to any Fall event! They are soft, moist, fluffy, and delicious! Hope you enjoy them as much as I do! Combine ingredients above and frost cookies once they are cooled. I also love making the frosting orange to be more festive or I sprinkle a little nutmeg on the top of each cookie! These look SO GOOD!!!! I’ve been searching for the perfect pumpkin cookie for forever! Pinned and can’t wait to try! Thanks Scarlett! I agree. Sooo good indeed.! Thanks for sharing the recipe.